The Philharmonia Orchestra is widely recognized as the UK’s finest orchestra with an impressive recording legacy, with this being their sixth album with Signum. Christoph von Dohnányi has been Principal Conductor for the past 11 years and has recently been made Honorary Conductor for Life. 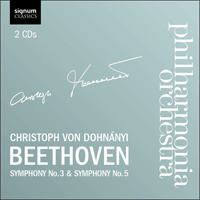 Two crowning achievements of Beethoven’s aptly titled ‘Heroic’ compositional period: Symphonies No 3 (Eroica) and No 5, arguably the single most popular piece of classical music in the Western canon. In October 1802, with these words, the 31-year-old Beethoven informed the esteemed publisher Breitkopf & Härtel, in no uncertain terms, of the new direction he was taking his music. Posterity now knows the following decade (roughly 1803 to 1812) as Beethoven’s ‘middle’ or ‘heroic’ period, a phase which is suffused with works that mark Beethoven’s ‘new manner’ as a turning point in the history of music: six symphonies, the last three piano concertos, the Triple and Violin concertos, five string quartets, several piano sonatas and his sole opera, Leonore (Fidelio). Beethoven’s musical scope had now widened considerably, the complexity and density of his musical ideas, and their psychological impact, is altogether remarkable—the idea of the composer as a sublime romantic artist, a force of nature, was emerging. The first truly ‘heroic’ work of this middle period was his Symphony No 3 in E flat Major Op 55, ‘Eroica’. It was composed following the penning of his famous Heiligenstadt Testament, an occasionally melodramatic, quasi-legal letter to his brothers outlining his despair at his encroaching deafness and the possibility of his imminent death. But the letter remained unsent and in a matter of weeks later he was again in the rough and tumble of Viennese life, writing the above letter concerning the Piano Variations Op 34 and 35 and taking verbal swings at publishers, badgering friends and cajoling counts. The following summer work on the Third Symphony began in Oberdöbling, a rural village outside Vienna and the work was completed by the spring of 1804. The symphony is entirely without precedent, being almost twice the size of most classical models previously composed. The opening movement is titanic in its scale and in the abundance and density of the musical ideas presented and developed. The two monolithic opening chords herald an absolute turning point in musical history—an epic musical battle played out in the grandest theatre. The second movement is another grand surprise, a funeral march which contains references to French revolutionary music. The Scherzo is likewise a novelty, bringing a greater sense of lusty, full-blooded rambunctiousness in contrast to the Trio section’s grace and poise. The final movement is a set of variations based on a theme Beethoven had previously used in the Piano Variations Op 35 (later known as the Eroica Variations) and in his ballet, The Creatures of Prometheus. In this symphony Beethoven had Bonaparte in mind, but as he was when he was First Consul. Beethoven esteemed him greatly at the time and likened him to the greatest Roman consuls. I as well as several of his more intimate friends saw a copy of the score lying upon his table with the word ‘Buonaparte’ at the extreme top of the title page, and at the extreme bottom ‘Luigi van Beethoven,’ but not a word more. Whether and with what the space between was to be filled out, I do not know. I was the first to bring him the intelligence that Bonaparte had proclaimed himself emperor, whereupon he flew into a rage and cried out: ‘Is he then, too, nothing more than an ordinary human being? Now he, too, will trample on all the rights of man and indulge only his ambition. He will exalt himself above all others, become a tyrant!’ Beethoven went to the table, took hold of the title page by the top, tore it in two, and threw it on the floor. The title page was re-written, and only then did the symphony receive the title Sinfonia eroica. There seems to be little reason to doubt the broad brushstrokes of Ries’s story, most notably because a surviving manuscript copy of the symphony bears witness to Beethoven’s fury at Napoleon announcing that he was to crown himself as Emperor of the French. The title page of the manuscript is headed ‘Sinfonia Grande Intitulata Bonaparte’, but the last two words have been so violently scratched out that the paper is severely punctured. Confusingly, under the composer’s name remain the words, in Beethoven’s own hand, ‘Geschrieben auf Bonaparte’ (‘written on Bonaparte’). This seeming incongruity rather displays Beethoven’s ambivalent attitude towards Napoleon, and indeed to royalty and nobility, too. His letters are peppered with slogans emanating from the French Revolution and his republican sympathies were similarly frequently put to paper. But the practicalities of being a composer meant that significant dedications to the nobility and royalty, even to Emperors, were a fact of life for even a composer of Beethoven’s stature, who could count many of the great and the good as friends rather than strictly patrons. The dedication of compositions to those at the top end of the social scale aided patronage, massaged egos and eased a composer’s path toward an appointment at court. They might also act as a useful calling card when travelling abroad. A composer had to play smart. Indeed, during the Third Symphony’s composition, Beethoven had considered the possibility of moving to Napoleonic France, and would, in 1808, consider a generous offer from Napoleon’s youngest brother to become court composer at Kassel. And in 1813 he dedicated his Wellingtons Sieg Op 91 to the future King George IV of England; Wellington’s Victory being an orchestral work which celebrates an early victory by that nemesis of the Bonaparte family, the Duke of Wellington. When the orchestral parts were finally published in 1806, they bore the new title, Sinfonia Eroica composta per festigiare il Souvenire di un grand’ Uomo (‘Heroic Symphony composed to celebrate the memory of a great man’). The eventual dedicatee was one of Beethoven’s extraordinarily generous and patient Viennese patrons, Prince Lobkowitz. The rights to the work were secured by the prince for six months and the earliest performances were given in his palace in 1804 and 1805. These performances allowed Beethoven to make numerous corrections before the work was finally set before the public on 7 April 1805. Naturally, such a challenging work could hardly be an unmitigated triumph on early hearings, but complaints aside, the smarter European critics were quite aware that they were in the presence of genius. I accepted the kind offer of Prince Lobkowitz to let me sit in his box … There we continued, in the bitterest cold, too, from half past six to half past ten, and experienced the truth that one can have too much of a good thing—and still more of a loud. Radiant beams shoot through the deep night of this region, and we become aware of gigantic shadows which, rocking back and forth, close in on us and destroy all within us except the pain of endless longing—a longing in which every pleasure that rose up amid jubilant tones sinks and succumbs. Only through this pain, which, while consuming but not destroying love, hope, and joy, tries to burst our breasts with a full-voiced general cry from all the passions, do we live on and are captivated beholders of the spirits. From this point on the Fifth Symphony grew to become what it remains to this day, the single most popular piece of classical music in the Western canon—its opening four notes enough to spark immediate recognition in even the most classically allergic individual. Composers have naturally fallen over themselves in its praise: Berlioz thought that it ‘emanates directly and solely from the genius of Beethoven. It is his own intimate thought that is developed’, while Schumann wrote that it ‘will be heard in future centuries, nay, as long as music and the world exist.’ As the Nineteenth Century progressed, it became the touchstone of symphonic construction and expression—the model composition for pretty much every symphonist, from Schumann to Mahler and, in some respects, up to Sibelius and beyond. With this one work the symphony ceases to consist of four separate musical essays, structures or dances held together by style and key structures. Instead we are given a completely considered whole. The Fifth Symphony takes us through a psychological journey from beginning to end, with the triumphant Finale being a logical conclusion of the preceding struggle.